To synthesize hemoglobin-AuNPs and lysozyme-AuNPs. Add 0.0524 g of HAuCl4·3H2O to a 50 mL volumetric flask and fill with distilled water. The final concentration of gold stock was 2.66 mM. Add 0.0717 g of lysozyme to a 50 mL volumetric flask and fill with distilled water. 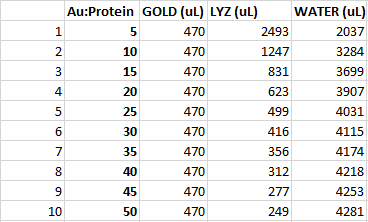 The final concentration of lysozyme stock was 100.28 μM. Add 0.0117 g of hemoglobin to a 50 mL volumetric flask and fill with distilled water. 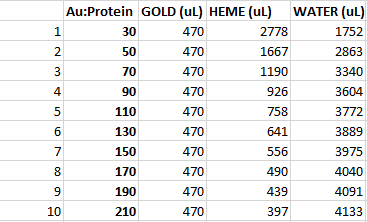 The final concentration of hemoglobin stock was 15 μM.